While attending last year’s American Elasmobranch Society conference, I was asked to fill out a survey concerning my views on lethal shark research. My response, along with those of many other participants, has now been analyzed and written up into a new essay in the Journal of Conservation Biology. Michelle Heupel and Colin Simpendorfer argue that lethal sampling of some individual sharks is sometimes necessary in order to get the data needed to protect those animals’ entire species. However, attitudes about conservation in general and sharks specifically are changing, and many (including these authors) feel that this is starting to affect marine biology as a science. It is undeniably true that certain important information can only be gained through lethal sampling. One of the main examples of this is “age and growth” data. Managers need to know how big certain species get, how quickly they grow, and how big they are when they are reproductively active. This kind of data is absolutely critical for any species management plan, and the best way we can get it is by looking at the vertebrae of sharks (like tree rings, shark vertebrae develop annual markings which can be clearly viewed under a microscope). You can’t look at shark vertebrae while they are still attached to the shark, and you can’t remove vertebrae without killing the shark. 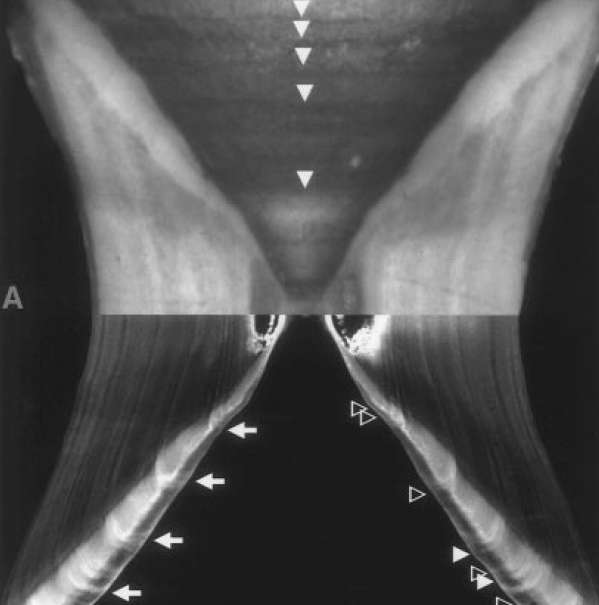 Vertebrae from a gummy shark, image from Officer et al. 1996. Sometimes sharks need to be killed to generate data that will help manage entire species or entire ecosystems. Other times, lethal research techniques are used to answer less vital questions, or they are used when non-lethal techniques would do. I once witnessed a parasitologist kill a healthy shark that we had caught in order to harvest gut parasites from it when sharks that had died less than twenty minutes ago as a result of being caught were available. The shark he killed was an Atlantic sharpnose, which are incredibly abundant in this region, but killing it was completely unnecessary. This is an issue that tugs right at my heartstrings. I got into this line of work because I care about sharks and I’m concerned about what’s happening to them. The thought of killing sharks troubles me because I am aware of their ecological importance and the reality that many species face extinction. Although I have participated in lethal “age and growth” studies for other scientists, my own research involves non-lethal sampling. I have no objection to lethal sampling if it addresses vital concerns and there are no alternative acceptable methods, but I’m more interested in performing research that does not involve the further destruction of sharks. Killing a shark for research elicits strong emotions for me and I’d prefer to leave those methods to other scientists. Do you think that killing a few individual sharks in order to create good management plans to protect entire species is ethically justified? Does my desire to avoid killing sharks limit me as a scientist? Does this growing trend among graduate students negatively affect shark science as a field? Does it make any sense for me to not want to kill Atlantic sharpnose sharks, which are not endangered, because they physically resemble (and are related to) endangered species of sharks? I’m a curator at a natural history museum studying vertebrates, birds in particular, so I constantly have to defend any collecting practice. This is a very broad problem in biology, not just limited to sharks for sure. I think it is important to note two things. First, all individuals die. We therefore strive to preserve populations, not individuals. Second, there are darn few species, none that I can think of, where their extinction was due entirely to scientific collecting. It is the commercialization of wildlife collecting, together with habitat loss, that are the primary problems, not regulated scientific collecting. If there is no collecting of sharks, or any other species for that matter, then there will simply be questions about their biology that will remain forever unknowable. I can’t imagine this being a good thing. Oh and by the way, the Southern Fried Scientist site is great. You guys keep up the good work. You make a good point when you say that all individuals will die at some point anyway. Since most fish are identical physically and mentally, and do not have the intellect that humans have, they may as well die to help their species. This is not just a broad problem in biology but in the sciences in general. I always try to put it in perspective. The number of rats that are being used for the testing of cosmetics is still greater than the number being used for aversive psychological testing. Just the same, the number of sharks killed by fishermen and boaters is most likely far greater than those that are killed for scientific reasons. I like how you say, “we strive to preserve populations, not individuals”. I think it’s such a vital argument, because what we might learn from the killing of one shark has the capability of preventing the death of far more. However, I definitely agree that these methods are extreme and, as in psychological research, should be used only when the research is necessary and when there is absolutely no other method that can be used. In fact, it’s a painful process to go through as a scientist, but there really should be an ethics board for this kind of thing. Even though I used a nonlethal method (gastric lavage) to get the stomach contents out of my spiny dogfish, I still had to kill some of them to verify that the method was working. I looked at it as a case of making the nonlethal method more viable in the long term. And for the sharks I had to sacrifice I tried to get as much extra data as possible: some reproductive data, take out the spines for aging, etc. I felt better about the sharks I was able to release alive, but knew that it would be necessary to sacrifice a few of them. As I see it, the best method is to try to get as much data as you can using nonlethal methods, and kill as few as possible if killing is necessary. I think you make your case well, WSM. My personal views, being a vegetarian and wildlife conservationist (or, as some of my colleagues like to put it – a ‘foo foo’ person), are that lethal research should only be performed if there are no alternatives AND if the research will help to assist conservation and management of the species concerned. I think that second point is important. I’m glad that the ethical viewpoint has been considered in this study. Just think how much better shape the natural world would be in if, at every step, we thought about how necessary our actions really were, and what the consequences for the species we exploit might be. Surely there must be ways to study any species besides killing them for scientific purposes! Please explain to me why they have to be killed to be studied!!!! Unfortunately you have to be prepared for the possibility of mortality whenever you’re out conducting field work. Even if your method of data collection is nonlethal, the method of capturing the animals in the first place still could be. I was sampling mine out of a trawl net. Just because I didn’t kill most of my sharks to get a stomach sample doesn’t mean some of them didn’t succumb to injuries or stress from being tangled in the net and squished together with everything else that was caught (though I will say that elasmobranchs generally seem to fare much better than bony fish in a trawl situation). I’m sure David encounters the same issues with his long lines. Whenever you have to capture and remove the animals from the water you run the risk of inadvertently killing them. I’m not saying you should be callous or cavalier about it, but it’s totally unrealistic to assume you’ll ever have 100% survivorship, and you might as well get used to the idea. No need to kill sharks for science, plenty are killed for mere fins. Use their body parts for your studies. Should be plenty of fresh pickin’s daily and I’m sure you could work out a beneficial arrangement with fishermen/poachers. The sharks die, the oceans die, we die. Which way do you really want to go? I agree in principle with the previous comment but in practice think that it is a difficult situation to manage. I have worked in various Asian countries where we had trade with local fishers and sea-gypsies (for live fish for both aquarium display and research). It is a hard situation to manage, and we found that once they knew certain species were of interest to us, and they may be able to make some money out of them, they would target those species specifically for us (and we certiainly hadn’t asked them to). We actually only wanted to take things from them that they had caught by accident, as a way to prevent them being killed and sold in local fish markets; but we ended up encouraging them to catch the species that we were trying to protect. I think that there is potential for the same problem to arise if scienists enter into arrangements where they get dead sharks for research from sources such as fishers. It is just another ethical scientific dilema; do we want to align ourselves in any way with poachers or people who are finning sharks; even if the species would benefit out of it through advances in scientific knowledge? And could this relationship ultimately be construed as encouraging those activities? I do not know of scientists that argue marine mammals must be killed for scientific purposes (besides the Japanese of course), so why do scientists maintain that we must kill sharks for scientific research? The double standard does not make sense. Sharks mature sexually late in life and killing them is not the same as killing a fish that reproduces quickly. I would imagine you can estimate the age of a shark from the length, rather than killing the shark to look at vertebrae. If scientists were more collaborative and fisheries data was more transparent, then it would eliminate the need for killing many sharks in the name of research. 50-odd million Sharks are being lethally sampled each year by the fishermen, plus I’m sure that quite a few Sharks die by accident during non-lethal sampling: I just refuse to believe that one cannot find suitable specimen among that lot – or am I missing something here? As a PhD student working on shark ecology/biology I have had this conversation with my major professor frequently (he being a classically trained ichthyologist and I being more of a marine ecologist). If possible I believe it is important to protect sharks from any unnecessary deaths resulting from research. As DaShark mentioned, fisherman kill millions of sharks each year why not simply use their catch for research (many don’t care if you take a vertebrae, as long as they aren’t fishing illegally) or even use the grant money that would be spent fishing and actually buy the animal from the fisherman. Growth rate/age is the usual reason people give for sacrificing sharks now that stomach lavage has become an accepted way of studying diet. While I understand the want for an immediate answer to a question about a sharks growth/age isn’t it more beneficiary to science to track movements and other patterns of the animal? This is why I use PIT tags for my animals and then you can measure growth between recaptures (this gives actual growth rate during a certain known time period) while still studying other aspects of the same shark. I understand that is much more difficult in larger species but could be done. I believe that the need for good science outweighs the want for quick science. I am both frightened and fascinated with sharks, so in my mind, killing a few sharks seems like a positive thing to me. It leaves me feeling just a little bit safer while swimming in the ocean at the beach. However, I know that sharks are imperative toward keeping the ocean’s food chain stable. I think that killing a few sharks for some very valuable data is okay to do if there are really no other options for collecting that same data. Scientists should try to find sharks that are older or sharks that are sick that may die soon anyway. Is there anyway to find sharks that have recently died, and collect data from them? For example, scientists could tag certain sharks and find them once they have stopped moving and passed away. I don’t know if that would be possible, but it seems like something modern science would allow researchers to do today. The desire to avoid lethal studies amongst sharks would not limit scientists if they were able to get all the information they need without having to kill them. The problem comes when you are missing information because of the opposition to lethal studies. Obviously if you are studying sharks is because you care about them, my question would then be, isn’t it worth it to kill a low amount of sharks in order to get vital information that in the future may play a very important role in saving other species in the futures? I think that lethal studies are sometimes a risk scientists have to take in order to protect the same or other species. The trouble is when people carry out lethal studies without even considering other options. If conducting lethal research on a shark is the only method of gaining extremely important information, then it is justified and understandable. However, lethal research should only be used as a last resort. Also, the maximum amount of studies/samples should be taken for each shark that must die. It is wasteful and unnecessary for a shark’s life to be ended for a single sample when many more types of samples could be taken. Personal convictions and ethics make this topic difficult for many people. Since science is not limited to lethal sampling, any researcher opposed to it is not limited as a scientist. The more and more I am reading these blogs the more I am overwhelmed and put off by the outrageous, unfair, inconsiderate and cuel things that are done due to “science.” As stated before, different species die everyday. What I am not understanding is that the most scientific research is being done with the species that are nearly extincted. So how can there be a growth or beneficial substainance that can be done if scientists are killing them which is more so helping the declining of their population. As I stated once before in a blog, anything that has to be killed is not fair and is illegal regardless. Nothing needs that much monitoring in examining growth that scientists have to kill them in order to do so. I agree with the general consensus in these comments that some lethal sampling is necessary for the greater good of the species. In those cases where it is not neccessary then I think it is horrible to do it- I don’t see why people who have dedicated their lives to study sharks would so carelessly kill them when not neccessary. As for your questions- I don’t see why it would limit the feild science or graduate students if there is no more unneccessary lethal sampling. If you can get the data while saving the animal wouldn’t this be the best for all? The last question I don’t really understand- why would you want feel more compelled to save a shark that looks like or is related to an endangered shark? I am very certain that smart scientists can easily perform their lethal sampling of sharks conduct solely on sharks mistakenly caught in commercial fishermen’s nets. at least decent scientists will do the extra effort of dealing with fishermen in order to find a practical mechanism in order to perform such basic info gathering without having to assassinate yet another shark who’s worldwide population is now EXTINCT. While lethal sampling is beneficial for studying certain species, I’m wondering how different this is from dissecting rabbits or bullfrogs in a high school science course. I’m not trying to promote unnecessary killing of sharks or any other species for that matter, but aren’t they relatively high up on the food chain? If so, how greatly, if at all, would these killings affect other marine species lower on the food chain? Given that sharks do not reproduce as quickly as other marine species, and that certain things can only be observed with dead sharks, lethal sampling is something which should be highly monitored/regulated. It seems there are plenty of sharks who die naturally or accidentally killed; why not just study them instead? It is unfortunate that there is no other way possible for biologists to attain these data samples, however in the name of Shark ecology, I believe lethal sampling should be used when absolutely necessary. Killing sharks should be used as a last resort in order to obtain the needed data (which I assume in all cases, would be used to help the Shark populations). It’s sad to say, but your desire to avoid killing sharks probably does limit your ability to be a scientific researcher. I am sure we can find that there are other ways around it though. For instance, agreeing with the comment above from ‘Talbtron’ who asked why not study the sharks who die naturally or are accidentally killed. I think this is a good way for the necessary research be conducted. I agree that lethal sampling should only be used when absolutely necessary. Sharks deserve to be protected and given respect but if they only way to obtain specific information to help them is to kill them, then it seems that lethal sampling is a must. Although I wholeheartedly believe that sharks that have already died or been killed for some other purpose should be used for research, this way no other sharks have to die in the name of science. It also seems that negative effects will arise in the field of shark science if more and more students who enter the field, refuse to use lethal sampling methods. I do understand the moral and ethical standpoints about not wanting to kill sharks for science, but if it is for the sharks benefit, lethal sampling should be done in order to help them. I have never been a true advocate of killing in the name of science. There are plenty of other ways to study or learn meaningful facts and statistics about sharks. I do support the submitting of already deceased individuals to science. It is possible that as increasing amounts students who are opposed to lethal sampling enter the field, changes will occur in the way testing is conducted. I highly doubt lethal sampling would come to halt, yet possibly a public data registry can be made for testing purposes so there will be no redundancy or excess unneeded killing of individuals. I think the lethal sampling of sharks is ethical when it is the only way to discover something that can help save the entire species. It is not ethical for scientists to kill a shark when their research does not require them to and they are just doing it to make it easier or because they are just not concerned about its species. They should always use killing as a last resort and for finding vital information. I think that your desire to avoid killing sharks may limit you in your field of research; however, it could also allow you to explore other ways of finding data. I do not think that the growing trend of graduate students not wanting to kill sharks is a negative trend. I believe when it is necessary for sharks to be killed for research that there will always be people who are willing. The growing number of scientists refusing to kill sharks could be beneficial to shark studies because it shows that these scientists really care about what they are studying, which means that they will be dedicated to finding ways to save these sharks. It makes since that you would not want to kill Atlantic sharpnose sharks even though they are not endangered. It is important for people to respect all animals and not just the endangered species. My first response to your post is to your question about whether or not your desire to not kill sharks, if even for science, limits you as a scientist. My response in short is no. Who decides which sharks live and which sharks die? On the other hand, if there are sharks that are extremely injured or dying, i do believe it would be acceptable, depending on the circumstances, to put the shark out of its misery, and then perhaps use if for science. This question of what is torture and where do we draw the line in the name of science, has come up before with various species including humans. While, I’m assuming the scientists killing these sharks must be passionate about their work and what they are studying, there must be alternatives to killing seemingly healthy sharks.I agree with the post above mine in saying that your desire to not kill the sharks is commendable. Just because the shark species is not endangered now, it does not predict what could happen to the species if we continue to be careless with their lives.